For my first excursion into the underground of Monterrey, I was led by the enigmatic Mou to see Los Implantes and Los Margaritos, two of the bands who have put out records on Nene Records, the label he runs with Anel Escalante. After surviving the utter entropy that is Monterrey traffic, we arrived at a nondescript two story house in a neighborhood that looked, as a majority of Monterrey’s neighborhoods do, like stack after stack of giant, disheveled shoe boxes. On the back patio of that house, amidst the palm trees and decorative tile, stood a stack of amps surrounded by tangles of extension cords and guitar cables. The first thing I was struck by, besides the seeming incongruity of a palm-shaded punk rock show and the proximity of the neighbors’ windows, was the diversity of the crowd. Black-clad punketos and the skinny-jeans-and- keffiyeh crowd mixed with kids in Polos and cargo shorts, sharing beer and cigarettes. Because, for many people in Monterrey, the only kinds of music that exist are norteño, cumbia, and reggaeton, the kids who have wandered off the beaten path of music have to stick together. This makes for an incredibly tight-knit, inclusive scene that promotes both creativity and collaboration. 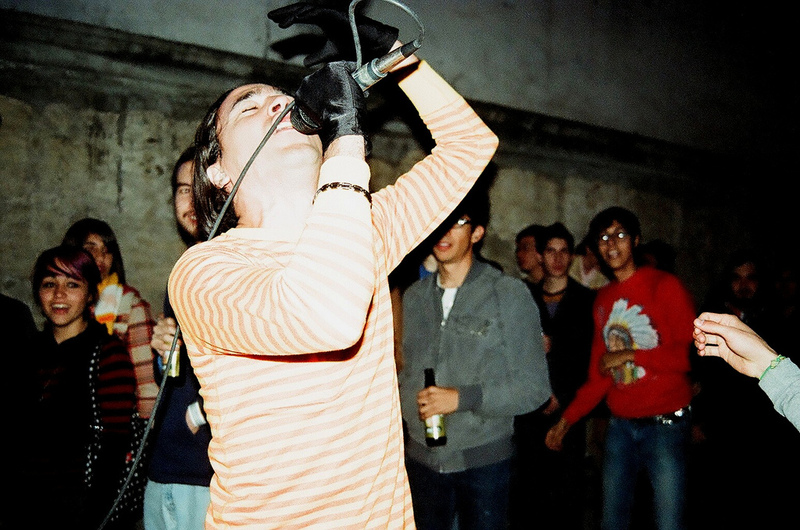 Los Implantes, a band that rose out of this collaborative breeding ground, took the patio first, blazing through a set of surfy, infectious numbers. As they set the mood with their fast-paced, raucous grooves, the Carta Blanca and Tecate began to flow freely. Once their final song was finished, Los Implantes quickly handed over their instruments to the boys of Los Margaritos, who wasted no time in ripping out a set of manic speed-punk. The Margaritos are one of the fixtures of the scene, as was evidenced when each of frontman Edwin Sandoval’s guttural screams were echoed by the 30 or 40 kids gathered around the patio. While both bands play fast and dirty punk rock, their music is somehow able to retain an air of playfulness. Los Implantes’ tight grooves are augmented with cheesey Casio keyboard presets and Los Margaritos laugh as they announce that their next song will be something that roughly translates to “Sperm from Hell.” This playful take on their music gives off great vibes, inspiring optimism instead of the downtrodden frustration of most punk music. This may simply be because it’s hard to be pissed off while standing under lush trees in the balmy air of Mexico, but playing optimistic music also may serve as a escape from dark side of Monterrey – the images of drug cartel wars and poverty that flash by on the nightly noticias. Albums from both bands are available for free download at nenerecords.net. This entry was posted in Brad Barry and tagged Los Implantes, Los Margaritos, Monterrey. Bookmark the permalink. Another great post Brad, and just so you know, some Casio presets are rather ingenious! I know two of the members of “los Implantes”, I can assure you there’s a lot of intentional tounge-in-cheek and sarcasm beneath the layers of punk surf and rockabilly, the Casio, pedals and much more are no accident. Author is right about the playfulness; in monterrey people are used to laugh at tragedies, I don’t agree with the take on punks hanging with polo shirt people (ha)…it’s not because the “alternative” scene is reduced and they have to stick all together, but rather that -at least in monterrey- you don’t have to wear certain clothes to belong to a subculture.